Interplanting MORE rows on top land. This is the first year we dIdn't get the planter. 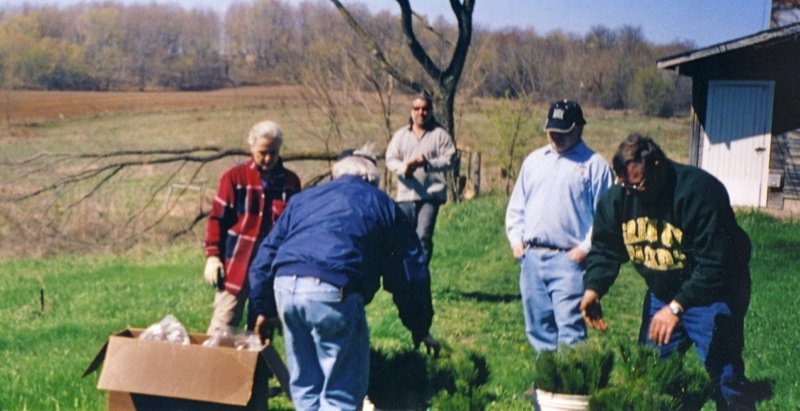 We were having so much trouble and this was ONLY 2000 trees - that we decided to try planting by hand. I plowed furrows the length of the upper field (top 40) and we broke into planting teams, grabbed a bucket of trees, and planted. NOTE from 2012: This explains where all the white pine came from in this area. I have just been prunning in this area and the predominant tree is white pine. Since we didn't plant any on the first pass in 2001, I was a little confused. Until I found these pictures. Tree planting crew members preparing trees for hand planting. I'm trying to find more information on this year. I will publish this as I find it. It's been a while. We're working hard on filling in the gaps that we're finding in the plantings. I understand you've been working with Roland so you may have heard some of this. Last spring we re-planted a section of CRP land on that grassy hillside facing the west side of the farm. Very little had survived there so last fall we plowed furrows and hand planted around 300 burr oak that I'd grown from seed � in treetubes. These were 3-year old oaks. We didn't get them all in before it froze so we planted the rest this past spring along with 1000 red pine and 1000 white pine from the DNR. We're not finding many red pine on that farm � after planting so many over the years � and when I mentioned it to the forest pathologist here, he said there is a good chance that the nursery stock is carrying a fairly high inoculation of Spaeropsis. I haven't done an exhaustive survey but for all the red pine we planted compared to the white (at least 4 to 1) it's a lot easier to find white on most of that farm. This is very disturbing. Even more disturbing after listening to the whole story the pathologist has to tell about the epidemiology of this disease. What do you know about this? Should I be so worried? We have a nice stand from last spring (and fall) planting. The potted oaks are doing great and there seems to be a good stand of pine (both white and red � so far). I need to do something more to control that grass. But the furrows � and hand planting � seems to give them a good start. 250 black spruce � to try in that low bottom land.